Hey there sweet Friends! I’m back today with another piece from that estate sale where I found this bookcase and these vintage night tables. But first, can I share something fun that happened at my house this weekend? 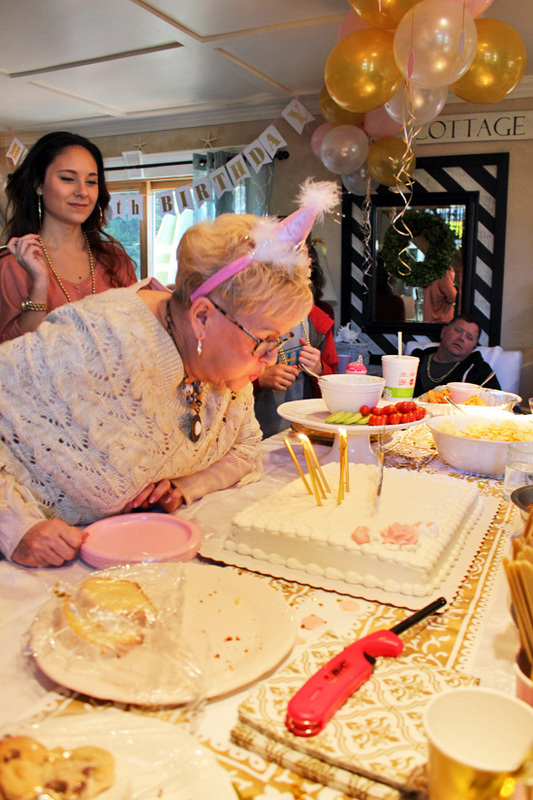 My Mom is turning 70 this week, so my Dad and my siblings and I decided to surprise her with a surprise party! 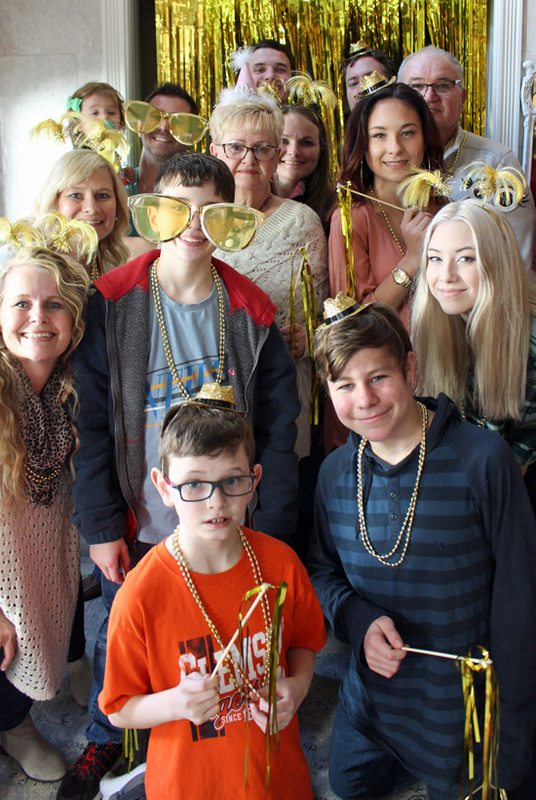 My younger sister lives here with her hubby and three boys, but my younger brother lives in South Carolina and my older sister lives in Wisconsin, but they all came for the surprise as well, along with their children! She had absolutely no idea! My sister and I told her we wanted to take her out to lunch for her birthday, so the plan was that my sister was going to pick her up first, then me and we would go eat, but of course we had other plans for her. Ok on to today’s makeover! It was marked $45, but everything was half price that day. Since it was right at closing, I offered $15 for it and they accepted! It was very rickety, but nothing a little wood glue and tightening of the screws underneath couldn’t fix. I’ve included a few affiliate links so you can find the products I use. Read my full disclosure here. I started by removing the top and painting the base. This is Fusion Mineral Paint in Casement. No sealing required woot woot! This was probably gorgeous at one time. I was going to remove all the old fabric, but when I got to this layer I decided to leave it. It will be fun for someone else to discover years from now. I found these at HomeGoods. They have so many pretty curtains to choose from that I love to use them for projects like this. 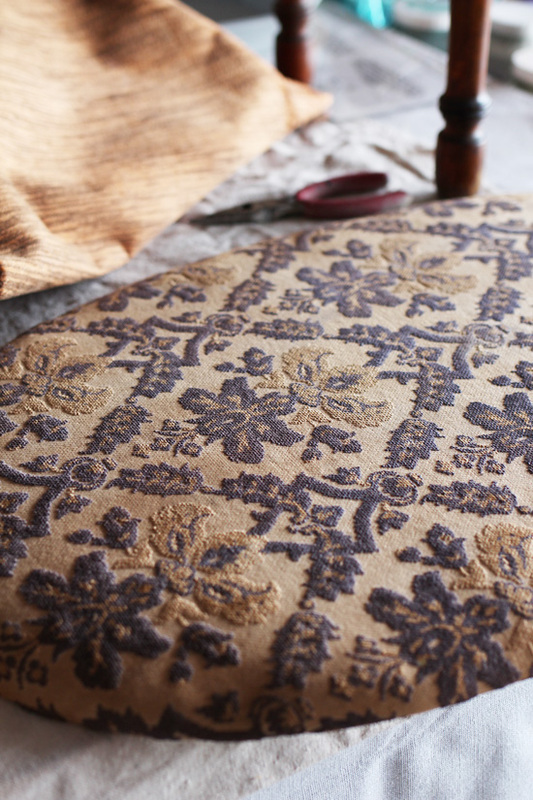 Isn’t this fabric so pretty? As you can see I also added piping. It is so easy to make your own. 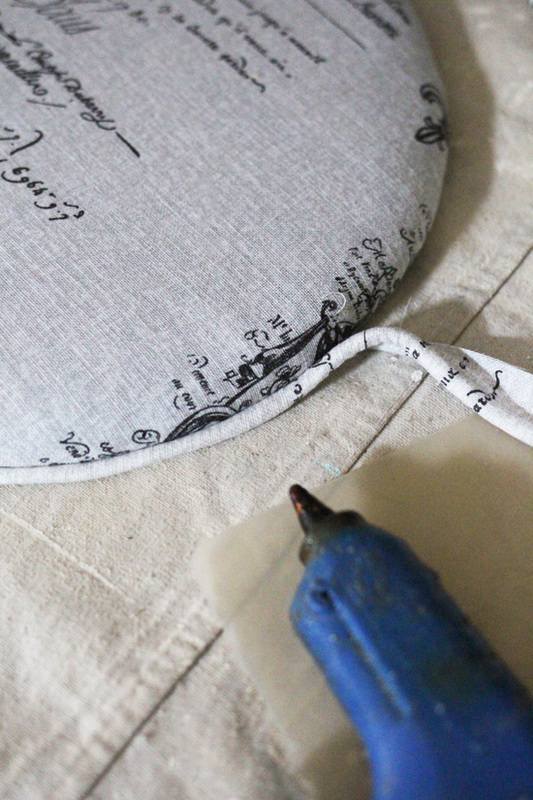 Check out my tutorial HERE for a sew and no-sew version. It just gets hot-glued to the edge. It adds such a pretty finishing detail. Glad I was able to make use of that purse and those shoes that I only used once! 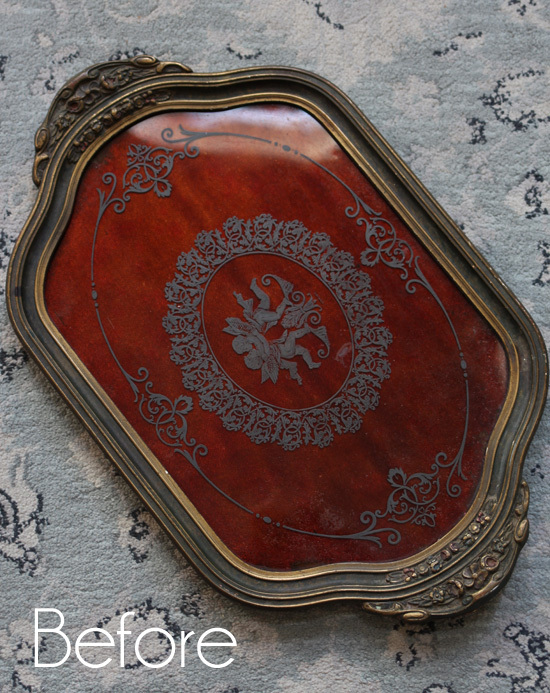 I kept the distressing minimal on this one…just a little here and there. Now if only I had a pretty dressing table to pair with it! Check out how I updated these French Provincial chairs that my Mom scored at an estate sale for only $50 for the pair HERE! That’s not to say it wouldn’t be pretty painted too…..but…..mmmm??? I guess I will have to wait until tomorrow. 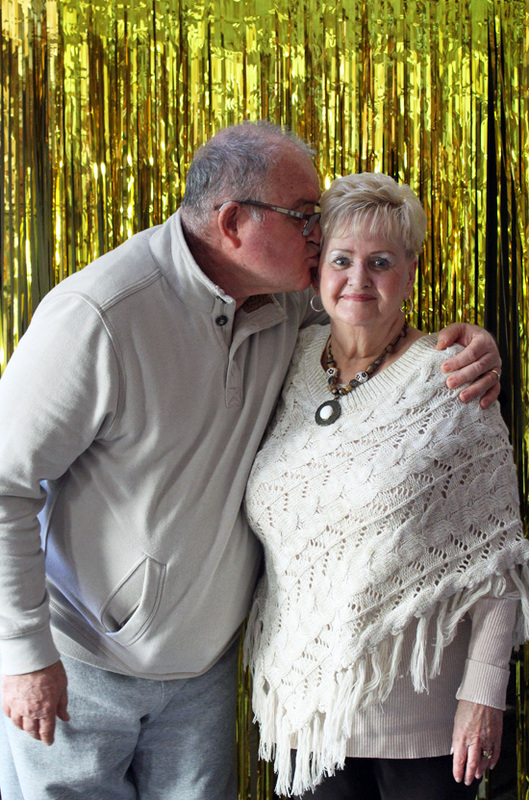 Mom is adorable…..Happy 70th to her!!!! Happy Birthday to your mom. I know that she was thrilled to have her family together to celebrate her big day. 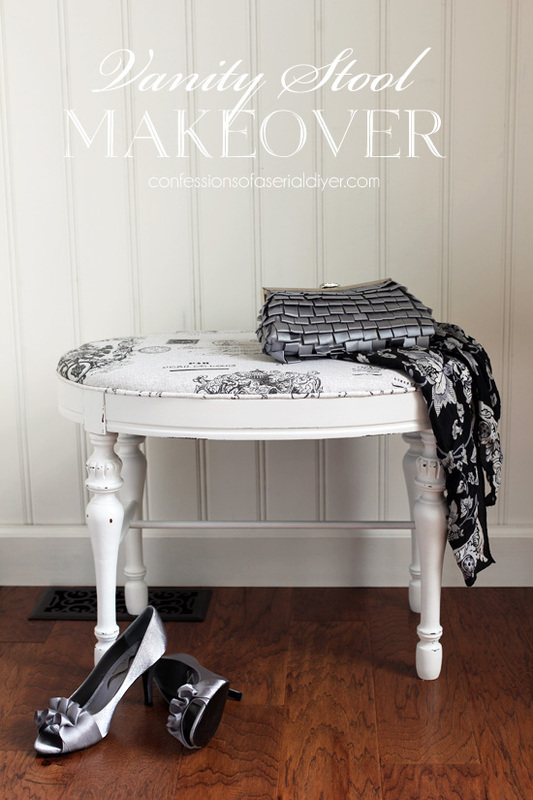 Your vanity bench turned out so pretty! Curtain panels do make great fabric. I’m still jealous that there isn’t a Home Goods near me. But when I do get to go, it is a thrill! 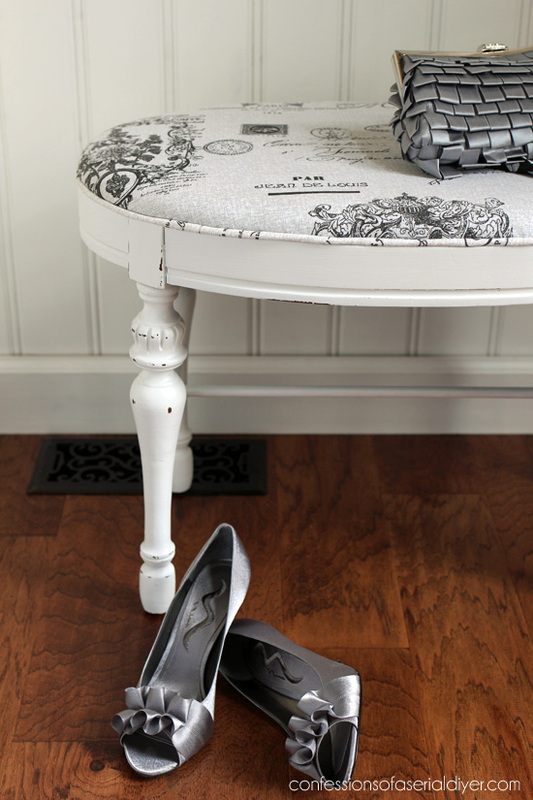 Keep an eye out for a vanity to go with the bench. I’ll bet you’ll run across one soon. Christy, you did so well with the party!! The video really shows how surprised she was and how happy everyone was. Beautifully done!! :))) Love the head tassel thingies. How precious is your Mom! What a sweet surprise!! 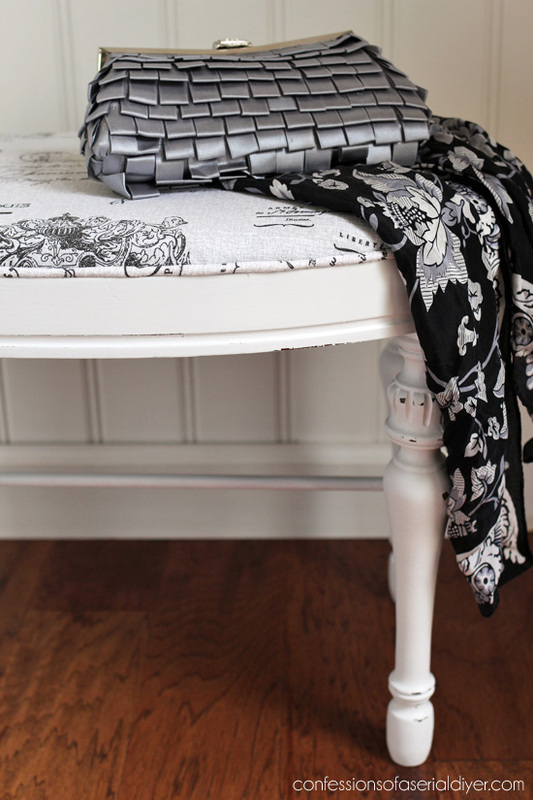 Love Love the stool…gotta go to Home Goods and check out those curtain panels too! Beautiful makeover!! You have such a beautiful family. Your mother is so cute. I’m not far behind her. I will be 68 Thurs (I’m a groundhog). Did you get your talent from your mother or father? Now for the bench; I love it and love the fabric (curtain fabric) you put on it. Looking forward to Thurs. Happy Birthday to your mom Christy! That was one surprised look on her face. It’s really great that you were able to get the whole family together. happy Birthday to your mom! I love the makeovers! Aw that is so sweet. Happy birthday to your mom! Love the stool too. I didn’t think to use curtain panels for upholstery! I’ll file that for future reference! You do good work! 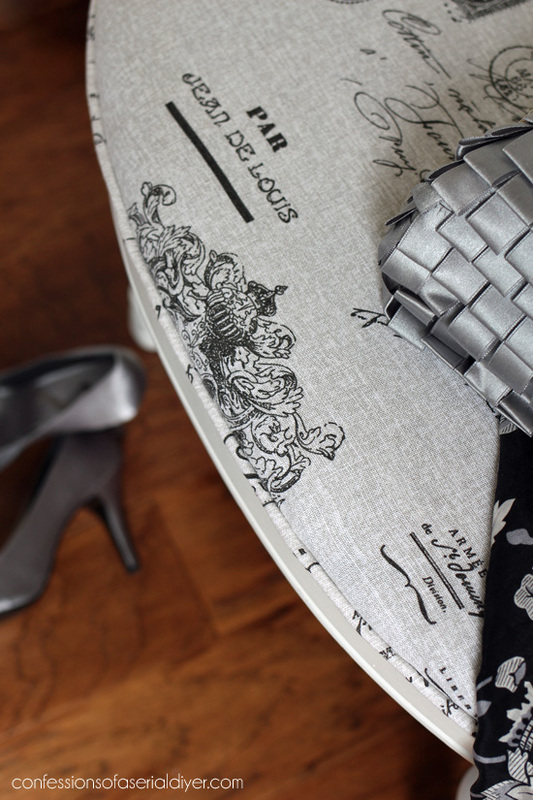 I ALSO admired the purse and shoes you used to style the bench! Cute little clutch. 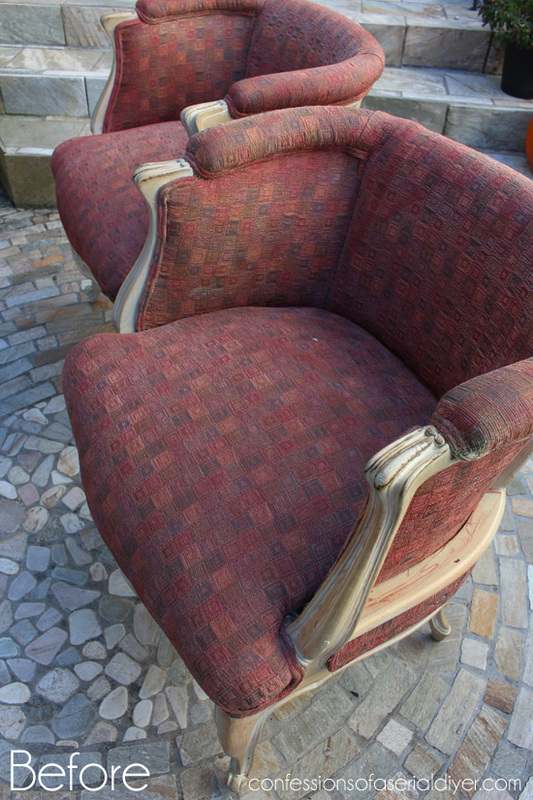 I am thinking to “dive in” into an upholstery job…it would not be hard for you…it all takes time. 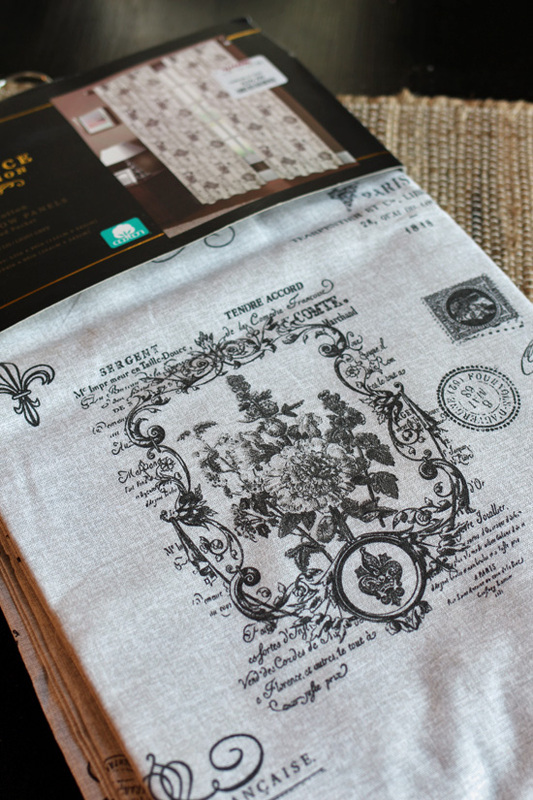 I have your tutorial saved on my “book marks.” I like the black/white toile curtain you chose. Good taste! You do it all and THEN plan parties for your loved ones too! I LOVE your posts! Makes my heart happy to see people cherish their Moms; lost mine 3 years ago when she was 81. I am sure I got my DIY bug from her, because I get the warm fuzzy feeling that she’s looking over my shoulder every time I start working on a project, as she was quite a DIY’er herself! Taught me everything I know about “junking”, as she called it! Love your posts! You’re my favorite friend for morning coffee! Aww! 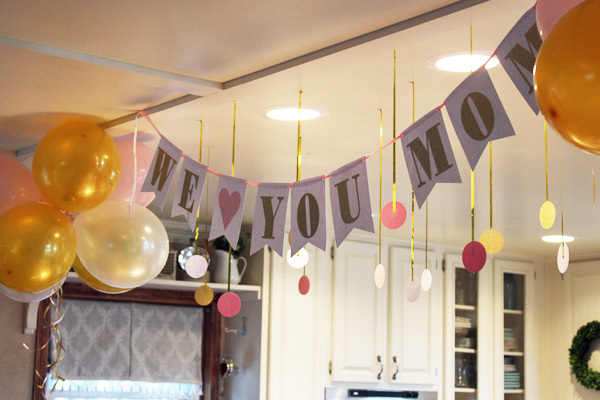 Your birthday party for your mom is so sweet. =) She looks great for 70!! What a wonderful birthday surprise for your mom. Happy 70th to her. Another great transformation. I love the material. Black and white is my fav combo. BTW-cute shoes. Happy Birthday to your Mom! Looks like she had a wonderful event!! Love the bench. I never thought of buying curtain panels for fabric. I have so much fabric stash I imagine it would be a long time until I needed to buy a panel! I have a rectangular vanity stool with similar legs. Here’s a link to see how mine turned out. 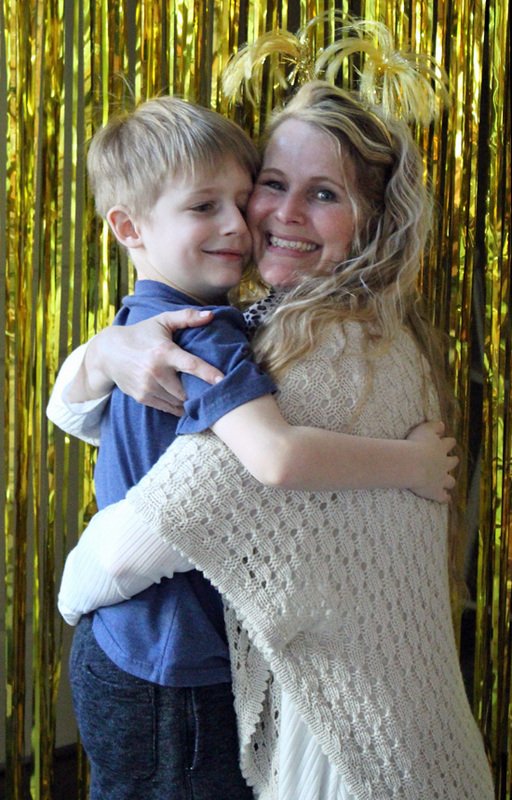 Awe, your Mom’s reaction was so adorable and how cute are your parents in that photo booth picture! 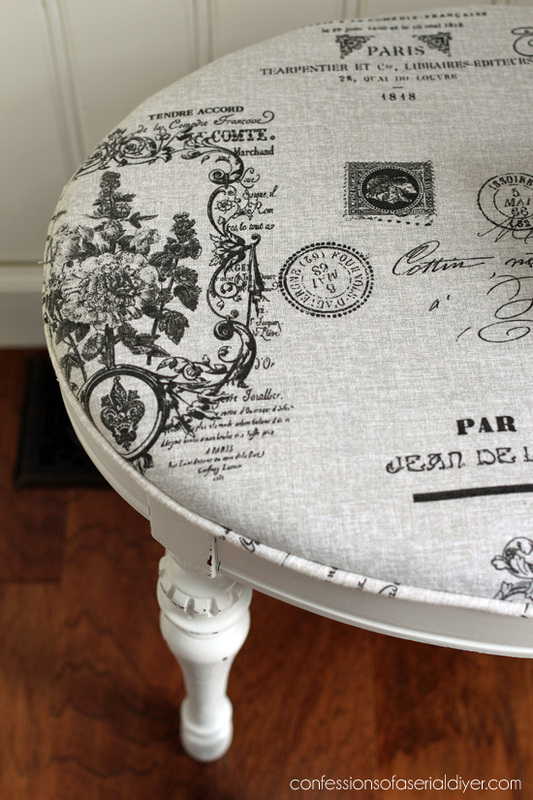 As for the stool, love the drapery fabric you used and the piping just takes the stool to another level. Lovely, as always Christy! This was a really fun post to read. I enjoyed all of the b-day pictures. 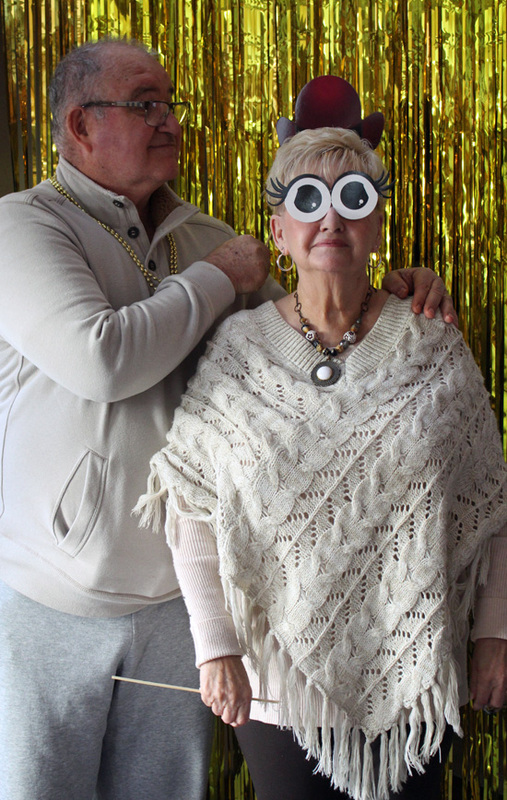 The photo booth was a great idea! The stool turned out beautiful. I’m glad you left the original fabric underneath. I was really drooling over those beautiful shoes as well! I have never used Fusion Mineral Paint before. 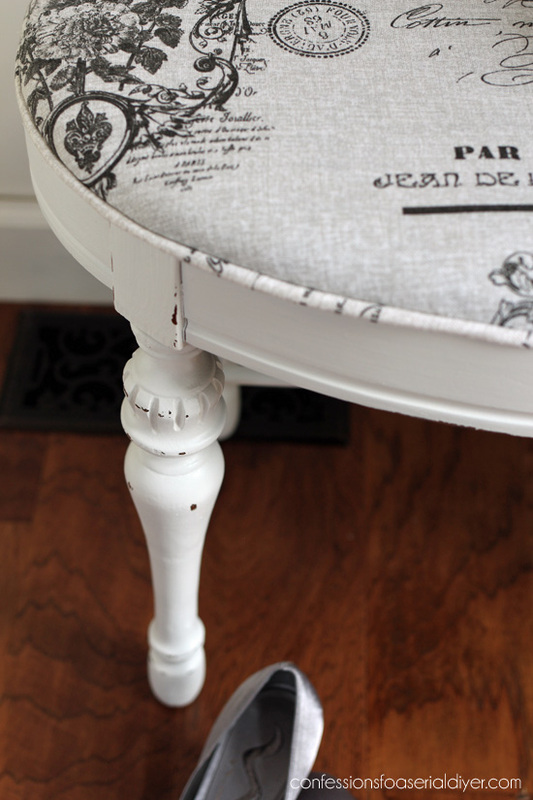 what do you like about it and do you think it is better to use than chalk paint? Your mom was so cute and surprised great looking family. 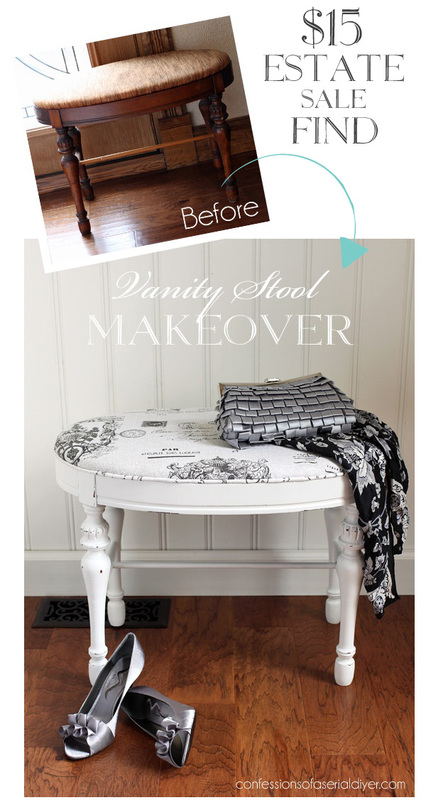 The stool makeover was great as always, can you do a piece with dark gray or soft pink? 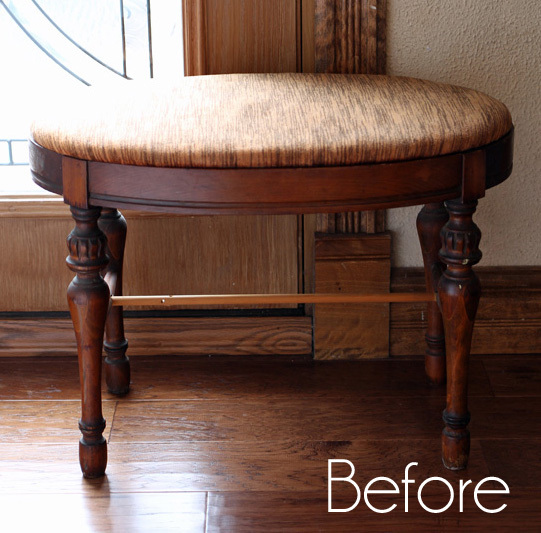 The fabric used on the vanity stool is beautiful but will it hold up to the kind of abuse stools like this usually get? I’m asking because I don’t know, not because I’m criticizing you, I enjoy your blog and find you inspiring, as in I have 4 mismatched chairs & 2 end tables in the back of my SUV right now. ohohoh! what a cute, sweet, and darling surprise! I love semi-wacky families who aren’t afraid of funny hats and accessories! wish i was close enough to come get that bench and maybe borrow those shoes! I love the makeover. I look forward the the next ones!! Love that stool, you did a wonderful job! That was awesome and your mom was so surprised! Enjoy her while she is here, my mom passes away in 2013 and I still wish I could celebrate with her.